Erica Ciszek’s research, teaching and service are closely tied to commitments of advocacy and social change. Through rigorous qualitative methods and development of critical theory, Ciszek's research examines the intersections of public relations and social change. Her work encompasses a triadic focus: (1) activism as public relations (conceptualizing social movement organizations as strategic communicators); (2) public relations as activism (conceptualizing public relations practitioners as organizational change agents); and (3) activism and strategic communication (considering how key stakeholders engage with communication materials aimed at them). Historically public relations and activism have had a contentious relationship within the practice as well as within the academy. Ciszek's research is part of a thread of pioneering scholarship in public relations that is part of what Moloney and McKie (2015, p. 154) call “the activist turn” in the discipline. Before launching her academic career, Ciszek worked as a strategic analyst for Mullen Advertising and Public Relations. 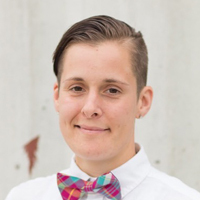 Additionally, she has worked in strategic analytics, market research and contributed to LGBT newspapers and magazines. As someone with professional experience in strategic communication working with nonprofits and Fortune 500 companies, Ciszek recognized the lack of diversity and representation that often characterizes the fields of public relations and advertising. Through her research and teaching, Ciszek is committed to making a space for marginalized voices and perspectives that have historically been written out of research. Her research has been published in the top journals in the field, including the Journal of Communication, as well as advocacy journals such as the Journal of Homosexuality. In addition to academic venues, Ciszek’s work, "LGBT advocacy in the digital age: Participatory media and the empowerment of an LGBT public,” has been translated by the Freedom House into Russian for distribution online.